Yesterday I received a card from my sister-in-law in Virginia. I am blessed with not only just an "in-law", but also a treasured friend. with the struggles and choices I’m facing in my life. This little verse had a huge impact on me as soon as I read it. For that reason, I wanted to share it with all of you. Thank you Cathy…I will carry this with me always. Thank you, Rhonda. Another one for my collection. Give that little angel a hug from us. hi rhonda, I have heard this before, it is so so true, thanks for the reminder. 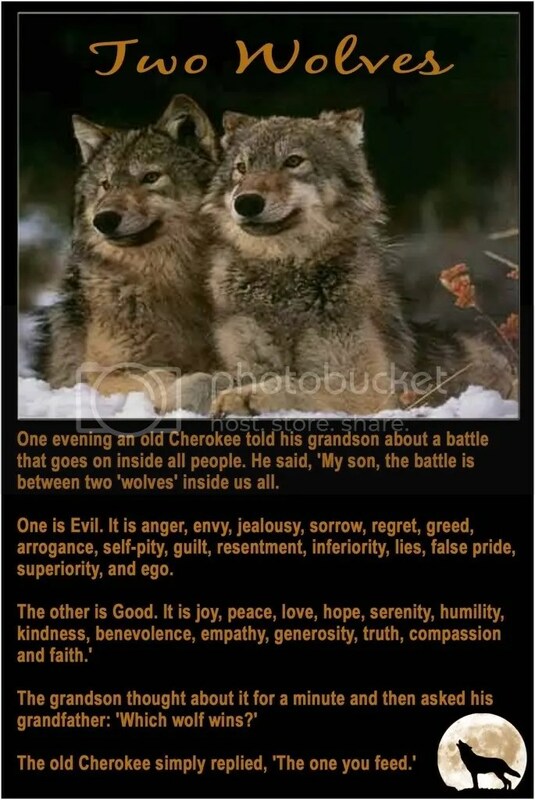 please god grant me to be the second wolf – god bless – hugs nita. I\’ve seent this before and wise words indeed. Great post! The story of the wolves is powerful because it leads to a choice every individual has the opportunity to make. With your entry you have hit the most important thing we can all do – teach our children by setting an example for them .. by feeding the right wolf.